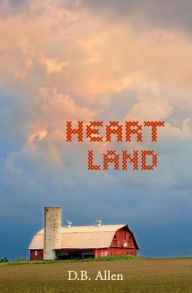 Heart Land by D.B. Allen is a recommended collection of interconnected stories set in the Midwest. Contents include eight stories: Last Storm… First; The Swing; Dan 4 Danica; A Single Word; Kaitlin’s on the Corner; Bookstore Confessional; Archie’s Reach; First Snow… Last. The first story, "Last Storm," is incredible and seemingly promises a stunning collection. This isn't quite the case. I was very much impressed by the first story, and found "Dan for Danica" and "First Snow" heart breaking. There is a surprising twist in "Kaitlin's on the Corner." "The Swing" and "Archie's Reach" are just depressing. "The Swing" features a wife reading diary entries made by her deceased husband years after they were written. While there are brilliant bits of writing interspersed throughout the collection, I thought the character development was lacking. In the end I found Heart Land to be an uneven collection. I was left feeling like the stories all depicted a bleak, rural, redneck heartland that I didn't recognize. That said, I can take sad and depressing and hopelessness, but I think, while the stories are somewhat interconnected, D.B. Allen could have done a better job developing the characters and their connections to each other in Heart Land. To be fair the print edition has eight drawings included for each story and my review copy only included one. Perhaps the drawings would have added to my experience. If I gave stars I would go 3.5 due to the moments of brilliance. Disclosure: My Kindle edition was courtesy of Silky Oak Press via Netgalley for review purposes.